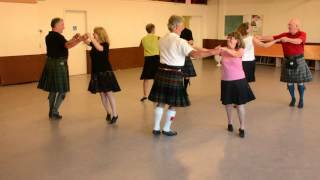 Sarona The Music Makars Scottish Dance Music CD+ 4 S32 4 4:30 67.5 Sarona/Mi'm Shuidh'an Deireach Bata/John Anderson, my Jo/Why Left I My Hame? Start (1,2,3x,4x). The dance is centro-symmetric. 1s & 4s dance out to sides - 1M+4L to 2nd place, 4M+1L to 4th place (Lady on Man's Right). All set NHJ with "new partners"
Added on: Feb. 24, 2015, 10 p.m.
Catalina Workshop 2018 2018-05-05 Ward Fleri Jan. 11, 2018, 7:26 p.m.
181119 The More Unusual Dance Club 2018-11-19 Peter Dixon Nov. 19, 2018, 2:02 p.m.